LUNAR TRANSIT:  The Moon is about to pass in front of the sun, producing an eclipse that can be seen only from space. NASA's Solar Dynamics Observatory will record the 2.5-hour  "lunar transit" beginning at 1331 UTC or 8:31 EST on Thursday, Jan. 30th. Tune into http://spaceweather.com for pictures during the event. 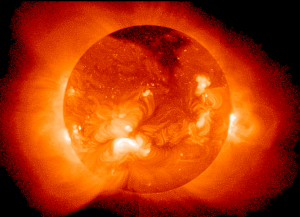 SOLAR FLARES: A large and moderately active sunspot is slowly turning toward Earth, increasing the chances of geoeffective solar activity this week. X-flare alerts are available from http://spaceweathertext.com (text) and http://spaceweatherphone.com (voice). NextUrgent Message for Ground Crew – Heads Up Everyone!